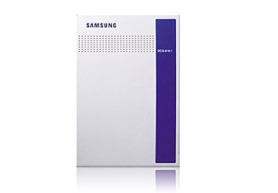 The Samsung DCS 816 enables businesses to react to customer needs swiftly and effectively. With the DCS Auto Attendant option, incoming calls are never on hold for long. The Auto Attendant can answer multiple calls simultaneously and provide customized greetings. External callers are prompted by the Auto Attendant to dial the direct extension number thus bypassing the operator. If no extension is dialed within a specified time, the call is automatically connected to the operator or another extension. The Auto Attendant can work independently or together with a voice processing system. The Caller ID option on the DCS phones shows the caller's name and number, even if you are on the other line. In addition, a single keystroke will save the caller's number so that you can easily return the call. When a group receives a call, the DCS will direct the call to the first available person in that group. If no operator is available to answer the call, the system will play a message which reassures the caller that assistance will be provided as soon as possible. System flexibility enables group supervisors to monitor the status of all incoming calls. The DCS allows for any combination of up to five extensions or trunk lines for a teleconference. People can be added to or removed from the group once it is established. The DCS system provides a variety of comprehensive data for management purposes, including cost reports and detailed reports of incoming and outgoing calls. The system can also be programmed to restrict certain types of calls (for example, international or premium rate numbers) to help eliminate any abuse of the telephone system. And with the comprehensive cost saving function, the DCS ensures that all calls are made at the most economic rate. The DCS keyphone system provides an integral paging system, which can be tailored to suit the caller's needs.